For as long as I can remember, I have held this belief that while science and technology are the body of a society, arts and literature are its soul. No society can progress holistically if both the aspects of its being do not evolve in sync with each other. For the longest time, there was a lull as far as literature is concerned, or perhaps I was oblivious of what was happening in the society. But recently there has been a surge in literary activities. My organization Literature Studio is just one such organization trying to make a difference. There are many others. The good part is the peaceful co-existence. One prominent organization that is doing good work in this field is Readomania. The organization is run by the very dynamic and inspiring Dipankar, and is a literary brand with interests in e-library for fiction and poetry, publishing – digital and print, literary products and events. Readomania’s online avatar has a membership of 10000+ literary enthusiasts and boasts of a collection of 2000 e-publications that are freely available to readers. Their publication division is five books old with ten more in the pipeline in this financial year. The focus is on innovative ideas like a composite novel, a fiction-nonfiction combination apart from novels and anthologies on unique themes. Readomania has now come up with an innovative concept called the #TalkFest, which is a new platform for talks, lectures, debates and discussions around the theme of literature and art. The objective of Readomania #TalkFest is to bring in new ideas and different perspectives on literature, art, reading and writing and in the process encourage interest in the subjects, in books and in reading. 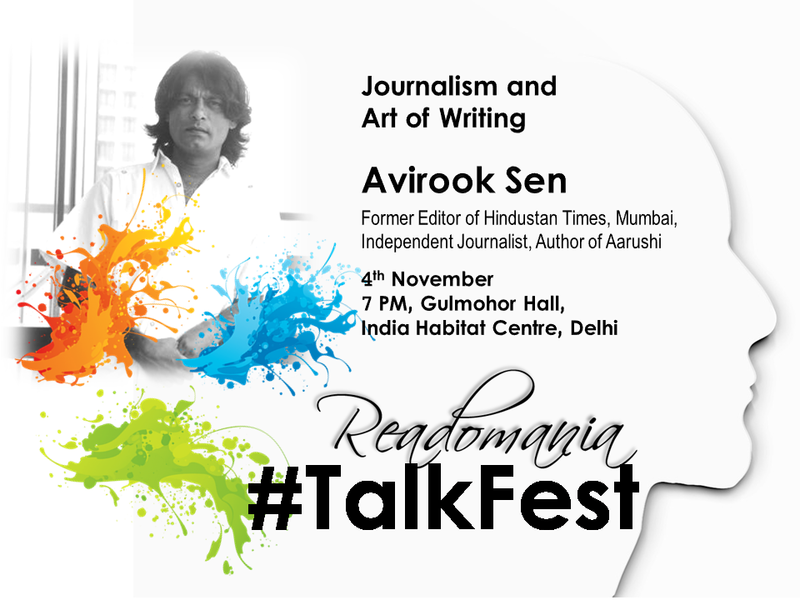 Readomania #TalkFest will be held in the first week of every alternate month starting from November at India Habitat Centre. Avirook Sen is an independent journalist based in Gurgaon. He has been a reporter and editor for 25 years, working in print, online and broadcast media. Sen launched the Hindustan Times’ Mumbai edition as resident editor, edited Mid-Day, and was executive editor of the news channel NewsX. He has written on a wide range of subjects, from cricket to terrorism and, most recently, crime. His work has appeared in India Today, Hindustan Times, The Express Tribune (Pakistan), New Scientist, NDTV, DNA, Firstpost, Mumbai Mirror and a number of other prominent publications. His first book, Looking for America (Harper Collins, 2010) was described by Vogue magazine as a ‘Kerouac-like’ travelogue, and enthusiastically reviewed. Well, Readomania has my attention now and I for sure will attend the #TalkFest. I bet you too are interested. If I am right, here is where you should RSVP: https://www.facebook.com/events/1482027965434633/.